In the 1990s, I set my mind to initiating education efforts and campaigns to stem the tide of mass slaughter of sharks for their fins. My first major success was to obtain the cooperation of Singapore Airlines in reconsidering, then ceasing, the offering of shark fin soup to premium passengers, an effort I started and coordinated by myself, as the shark fin issue wasn't mainstream at the time. In fact, many people in Asia back then considered me a troublemaker and an idiot. I'm delighted that many still do. That initial campaign required the assistance of friends, as well as thousands of people around the world I had never met, who collectively expressed their views via email (a relatively new concept at the time! ), fax (what's that? ), and even post (say again...what's that?!). Now, 17 years later, I just received this illustration from a friend who helped out with that campaign and more. 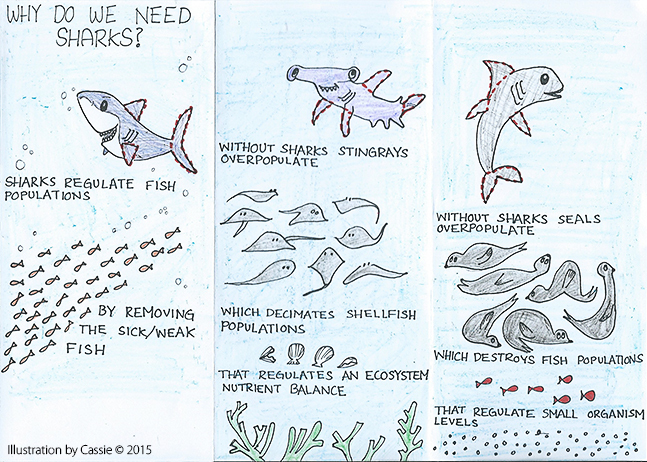 His daughter Cassie drew this for a multi-disciplinary school project about the biology of the seas (Correct me if I got that wrong Cassie!). I think I'm getting old, because when I saw this, I felt an upwelling of emotion, a combination of happiness...as this graphic demonstrates that over the long-term, education works...and pride...for the fact that my friends have raised such a great kid (kids actually). These days, the spotlight is on the shark fin issue, and fortunately, it seems like we're finally turning the corner on this problem. More and more, kids in Asian countries are becoming aware of the problems associated with over-exploitation, and the voice of high profile people like Yao Ming campaigning on this issue is invaluable. One thing we need to bear in mind though, is that even as we make progress on the shark fin issue, the damage we are collectively wreaking on the environment is escalating at what seems to be an exponential pace. For example, how many Javan rhinos do you think are left in the wild? Perhaps a few dozen, if that. How much pollution hits our waters, land, air every day, affecting everything and everyone? Frightening if you think about it. How many cetaceans each year are hit by ships, caught in nets, entangled in longlines, die of plastic ingestion, perish in agony due to organ damage from manmade sonic booms? There's no exact count, but I'd wager many hundreds, if not thousands. If you're up-in-arms about whaling, you should be up-in-arms-and-legs-and-more about these issues. Anyway...my point is that the only way to effect permanent change is to educate yourself, then others. I'm not talking about contributing a few dollars to a group and then sanctimoniously lecturing people. I'm talking about looking at your own life, the lives of those close to you, and implementing positive, constructive, incremental changes. It's not about money; it's about heart.